Upon reading this, I did my due diligence, sampled each and fell in love with The Wombats, also from McCartney’s hometown of Liverpool. By the looks of the packed crowd at Union Transfer Tuesday night, I’m not alone. The secret was out about this energetic, post-punk trio from Liverpool. Kicking off the night were a perfectly paired New York group called Nation of Language led by Ian Devaney. They have a decided 80’s-era sound and performance style with nods to Talking Heads and Tears For Fears. Huge energy with a lot of movement and strong performance got the crowd going early. 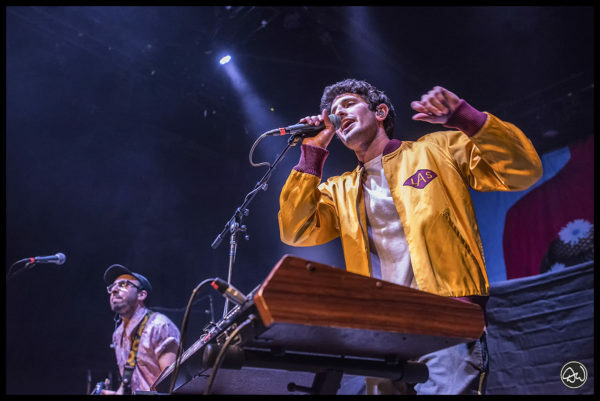 In direct support to The Wombats was L.A.’s Courtship, led by Eli Hirsch and Micah Gordon. The touring band included bass and drums, but the show was Eli and Micah front and center. Self-deprecating, bright, sunny and energetic from start to finish, they were the perfect band lead into the headliners. 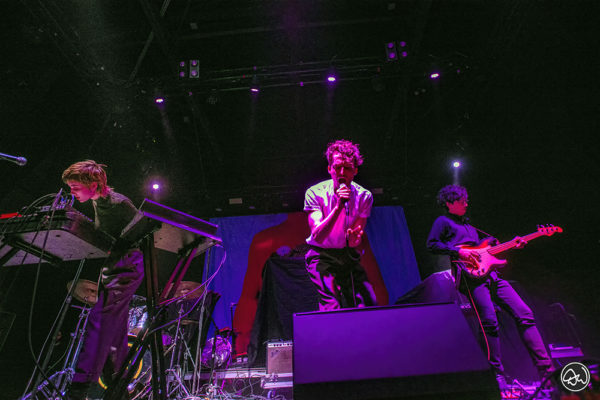 As a relatively new group beginning in 2016, they worked their fun poppy catalog, but slayed the audience with a most impressive sing-along version of Outkast’s “Hey Ya.” Between songs, the duo engaged the audience with stories about this being their first visit to Philly and how back in high school, The Wombats hits got them to stop listening to Green Day. They had the crowd from that point for sure. Shortly after 10:00 PM, The Wombats took the stage leading off with “Cheetah Tongue,” the new single from their soon-to-be-released album “Beautiful People Will Ruin Your Life.” About a minute into it, lead singer Matthew Murphy (“Murph”) unexpectedly began looking back to drummer Dan Haggis laughing. The music stopped and through their laughter, Murph explained that they had just learned the song and had screwed up the lyrics. Another member of the tour told me that they had been practicing that song all day hoping to have it down by showtime. So off they went from there with a perfect set of seventeen tunes spanning their nearly fifteen-year career. 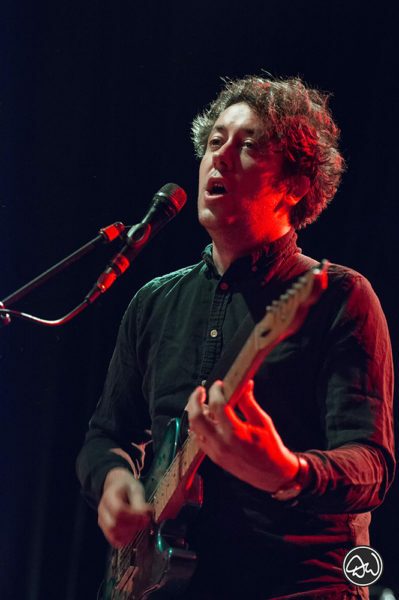 The Wombats are an Indy, Post-Punk three-piece band with a heavy New Wave influence. The tunes are well-crafted pop with upbeat tempos supported by strong drums and the high-flying bass of Tord Øverland Knudsen. 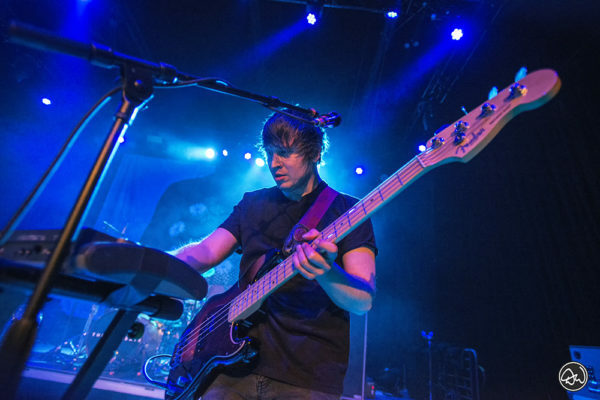 While Murph and Haggis plant themselves behind their instruments, Knudsen is in constant motion bouncing and jumping everywhere on the stage. He brings a remarkable energy that seems to fit the rhythm-heavy songs. Next up was crowd-pleasing “Give Me a Try” from the killer 2015 “Glitterbug” album. Walking through the audience, it seemed everyone was mouthing the words to this hit. While the setlist was well-balanced choices going back to 2007, nearly a third were from Glitterbug and four from the new one. The encore wrapped it all up in a career spanning way with the head bobbing “Let’s Dance to Joy Division” followed by the spacy, hook-heavy “Greek Tragedy.” A packed house on a wintery Tuesday night with a show starting after 10PM … These guys have it going on. “Beautiful People Will Ruin Your Life” debuts February 9th.